We offer high efficiency Induction Annealing Machine that is highly appreciated in the national as well as international markets. Annealing is a heat treatment process that is perfect to change the physical properties like hardness, strength etc. of materials. We have carved a niche as one of the key Annealing Machine Exporters based in India. 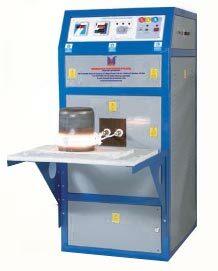 Our Induction Heat Treatment Machine is precisely designed for Annealing, Stress relieving as well as normalizing of Stainless Steel, Aluminium Utensils and All Cold Formed Steel Components. Easy operation, robust construction and high speed are some of the salient features of our Induction Annealing Machine. Lesser Annealing cost comparing to conventional methods. Auto or manual mode factor. Some of the application relate components. Power range 05-15 kW. 15-30kW. 30-50kW. Frequency range 01-400kHz. 05-30kHz. 05-30kHz. Input Power Range Single Phase 230V / 50 Hz. Three Phase 440V / 50 Hz. Three Phase 40V / 50 Hz. In our endeavors to make better products, Microtech induction Pvt. Ltd. Reserves the right to change any specifications at any moment and without prior notice, yo the models (including programming), their accessories and optionals.